This is a weekend bonanza contest. This contest is on Facebook. It's conducting by iReff. 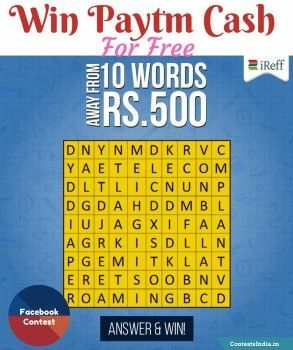 Participants just have to look in the image and find 10 words which you would associate with iReff. 2 lucky winners will be selected and each will get Rs.500 Paytm cash each for free. This contest is ending soon. Participate now to win Paytm Cash for free. "Sharing is Caring - Please Share the Posts"